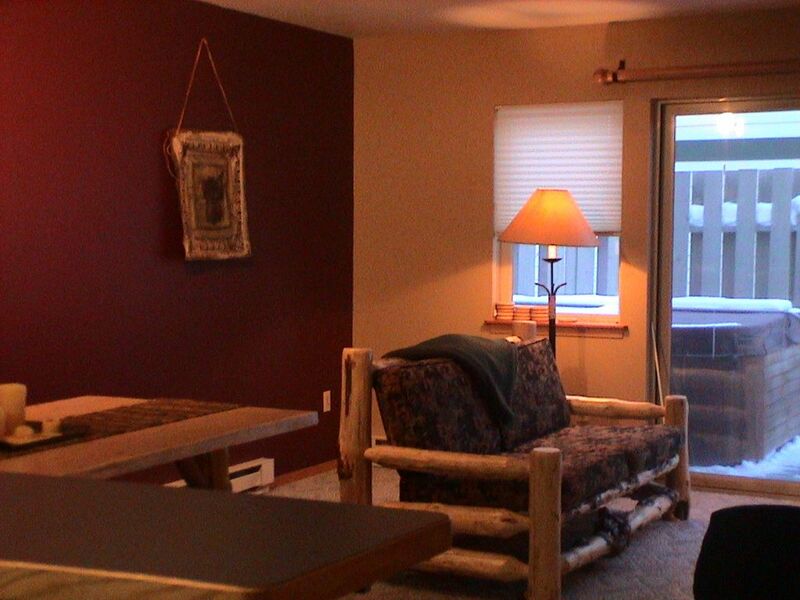 Our Madison Court Condo, located in the Meadow Village of Big Sky, offers the best of year-round Montana recreation. The condo is just steps away from dining, shopping, recreation, and ski shuttle. Attractively furnished and decorated, the unit sleeps six to eight guests with two queen-size beds, a sleeper sofa, a queen futon mattress and two hidden twin mattresses. Other features include a private hot tub, in-unit washer and dryer, fully-furnished kitchen, heated garage, Cable TV, DVD, CD-Player with Surround Sound, and Wireless internet. Let us be your 'Home Away from Home' and help make your vacation to Beautiful Big Sky a memorable one. Keywords: Two-level Townhouse. Middle unit of three. I have lived in Montana on two separate occassions and have always gravitated to Big Sky. I bought this condo in 1998 so I would always be 'anchored' to the area. I liked the location as it's central to everything year-round. Super-convenient location offering Ultimate Access; Peace & Quiet - Walking distance to everything - Great restaurants, grocery store, New Town Center, Ski Shuttle out the back door - Wonderful people; Laid-back attitude; Lack of Stress. Double sink, closet with full-size washer-dryer; shower tub, toilet with separate door. Multiple towels for kitchen, bath, and hot tub. Kitchen fridge with freezer. Separate deepfreeze in garage. Refrigerator, Dishwasher, Stove, Range, Microwave. Non-stick pots/pans; high quality cutlery, Coffee maker. Long Split Log Bench for Oversized Dining Table. Bar with 2 benches. Come on...YES! It's Big Sky! The condo is located in the heart of Big Sky's Meadow Village, which is an ideal spot for year-round access. Restaurants, Ski Shops, Grocery Store, Ice Skating, New Movie House, and Ski Shuttle access (right behind unit). Everything you need for a great vacation just steps out the door.